Chala Handbags are designed with just the right blend of whimsical playful fashion while maintaining practical functionality. Give your day a creative spin with their unique designs! Made of textured faux leather. Zipper closure. Contrasting faux leather trim and stitching.. 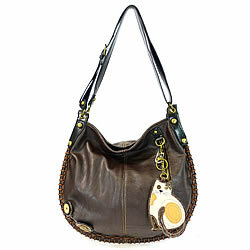 Features antique brass toned hardware with zippered top closure. Front slide pocket with patterned fabric lining. Colors may not be exactly as pictured. Lining patterns may vary. 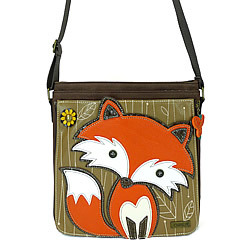 Measures: 5" x 3/4" x 7"
Strap adjusts to Clutch, Wristlet, Purse or Crossbody. Made of faux leather. Detachable character key fob/coin purse included! 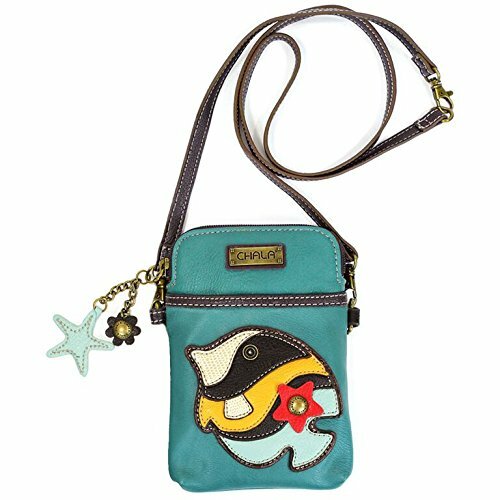 Convertible strap changes hobo to crossbody bag! Fabricated flower and wood buttons. Top zip closure. Front zipper and rear slide pockets. Patterned fabric lining. Inside slide and zipper pockets. Antique brass toned rivets and buttons. Colors may not be exactly as pictured. Lining patterns may vary. 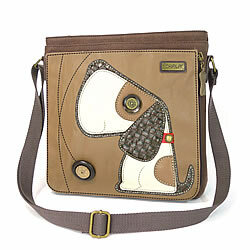 Measures: 16-1/2" x 1-1/2" x 13"
Convertible Strap: 13" - 23"